In a remote area of Siberia, outside the small town of Batagaiin the Sakha Republic, the ground suddenly opened up between 25 and 50 years ago, and it never stopped. The crater now measures a mile long and is almost 400 feet deep. Geological surveys suggest that the crater has been growing over 60 feet each year but, despite its size and rapid growth rate, most people outside of the immediate area don’t even know it exists, let alone how climate change is making it worse. The chasm is dubbed the Batagaika Crater, and locals refer to it as a “gateway to the underworld.” Its location, in the middle of a vast boreal forest, is no accident. The catastrophic chasm probably wouldn’t exist if not for the surrounding trees, because it’s presumed that the crater was inadvertently created when a swath of forest land was cleared. The Siberian Times reports that happened in the 1960s, while other outlets have reported it as being in the 1980s or 1990s. Regardless, the deforestation caused the land to begin sinking, and the crater was formed. Recent warmer temperatures brought on by climate change have continued to melt the permafrost, accelerating the sinkage of the crater, which is shaped like an incredibly giant tadpole. Major flooding in the region in 2008 also contributed to the crater’s growth. 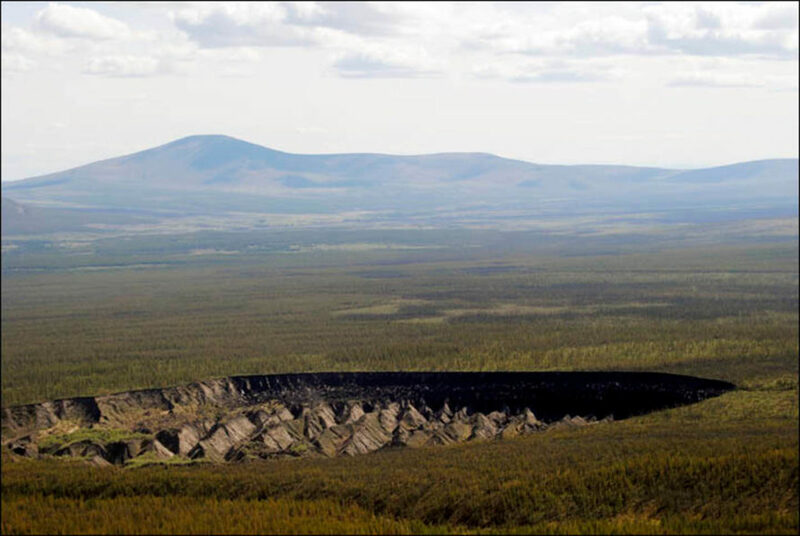 Similar craters have been reported in northern Canada, but none come close to the vast size of the Batagaika Crater, also known as the Batagaika ‘megaslump.’ The geologic event in Siberia is two to three times the size of the next largest crater with a similar origin story. “I expect that the Batagaika megaslump will continue to grow until it runs out of ice or becomes buried by slumped sediment. It’s quite likely that other megaslumps will develop in Siberia if the climate continues to warm or get wetter,” Dr. Julian Murton, a geology professor at the University of Sussex said in an interview with Motherboard. He is one of few researchers investigating the site, alongside a team from the Institute of Applied Ecology of the North at the North-East Federal University in Yakutsk. For decades, a giant crater has been growing in Siberia. It was allegedly kicked off by deforestation, and its continued growth is caused directly by climate change.